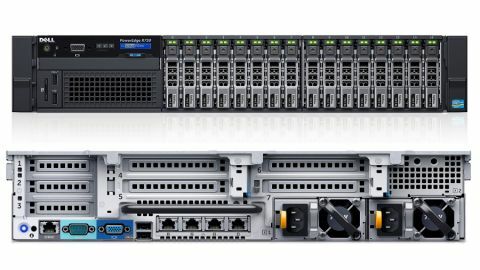 The latest generation of Dell's 2U PowerEdge R700 series takes full advantage of Xeon v3 and DDR4 tech, and is a powerful and flexible platform for a wide range of IT needs. Despite all the hype around the benefits of a converged infrastructure, the market for standalone servers remains strong with Dell one of the contenders for top spot with its PowerEdge family of tower, rack-mount and blade server platforms. Now in its thirteenth generation, many of the models have been uprated to take advantage of the latest Haswell-based Intel Xeon v3 processors, including the new PowerEdge R730 which has sockets to take two from the Haswell-based Xeon E5-2600 line-up. It also boasts DDR4 memory and a range of flexible storage options to suit everything from general purpose file and print duties, through email, web and database hosting to providing a highly scalable server consolidation and VDI platform. The R730 follows the traditional rack-mount server design with a heavy, robust and extremely well engineered all-metal chassis designed to take up two rack units (sliding rails are included) with a lift-off lid for ease of access. Most of the components are then colour coded – blue to mark those that can only be changed when powered down and a light red (Dell calls it terracotta) for those that can be hot-swapped. A pair of redundant power supplies slide in at the back. These were rated at 750 Watts on the server we looked at although higher wattages are available to match the processor and storage combination chosen. Each power supply also has its own fan although most of the cooling is handled by a bank of six fans in the middle of the chassis. These can be hot-swapped and the complete array lifted out for ease of access to the rest of the server. Some care is needed when it comes to storage configuration as, although the R730 can be equipped with small form factor drive bays to take sixteen 2.5-inch disks or SSDs, this has to be specified up front and the review server had metalwork for just eight with no upgrade available to add to this later. A chassis to take eight 3.5-inch disks is also available. Sold mainly into corporate datacentres, customers are unlikely to ever try and save money by specifying a single processor inside the R730. However, there are lots of options and you don't have to splash out to get the 14 cores/28 threads provided by the 2.3GHz E5-2695 v3 processors in the review server featured here. Indeed, you could start out with a pair of E5-2650 v3 chips, with exactly the same clock speed plus 10 cores/20 threads per processor, denting performance a little but saving just under £2,400 (around $3,660, AU$4,800). For less demanding applications, a pair of 6 core/6 thread E5-2609 v3 processors would shave £3,646 (around $5,570, AU$7,290) off the price of the review system. RAM can also be expensive with support for the latest DDR4 memory technology provided, courtesy of the Intel C610 chipset on the Dell motherboard. Ours came with a modest 64GB of ECC protected memory, filling just eight of the 24 available DIMM slots. Maximum count is 768GB using 32GB modules although when we checked the Dell website only 16GB DIMMs appeared to be available. Extra RAM, of course, can push the price up considerably and it's worth noting that some of the lower specification processors are limited to accessing memory at 1,600MHz or 1,866MHz rather than the 2,133MHz supported by the review setup.